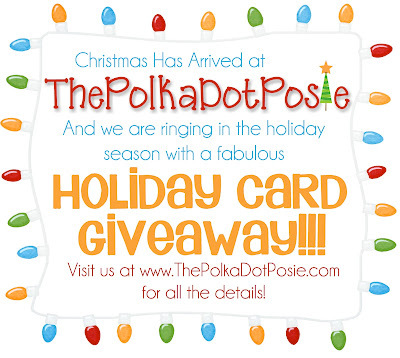 The Polka Dot Posie: The Fabulous Christmas Card Giveaway! We are excited to announce that Christmas has arrived at ThePolkaDotPosie!!! And we have some fabulous new stocking stuffers on the way!! 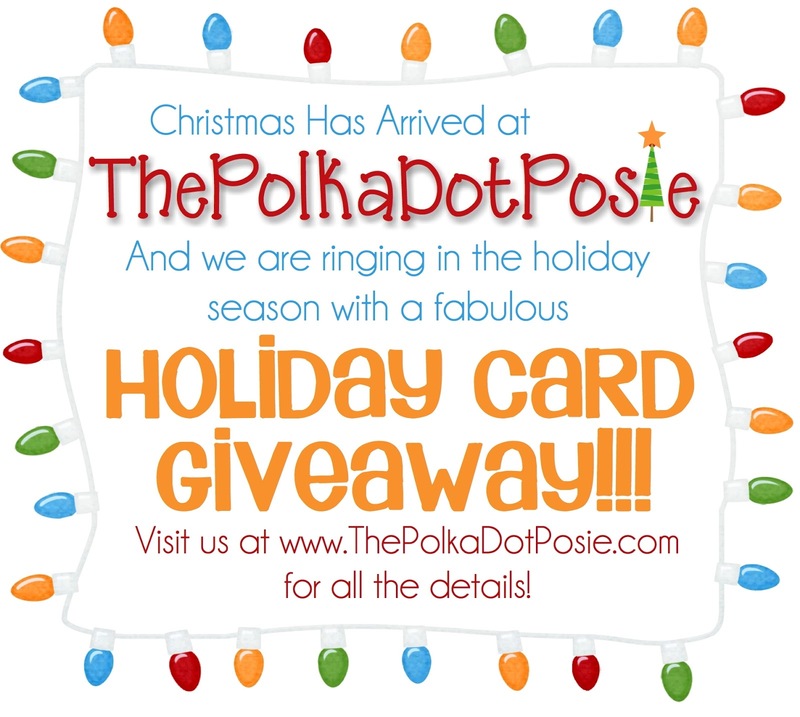 To help us celebrate the arrival of Christmas, we are hosting a fabulous GIVEAWAY!!!! 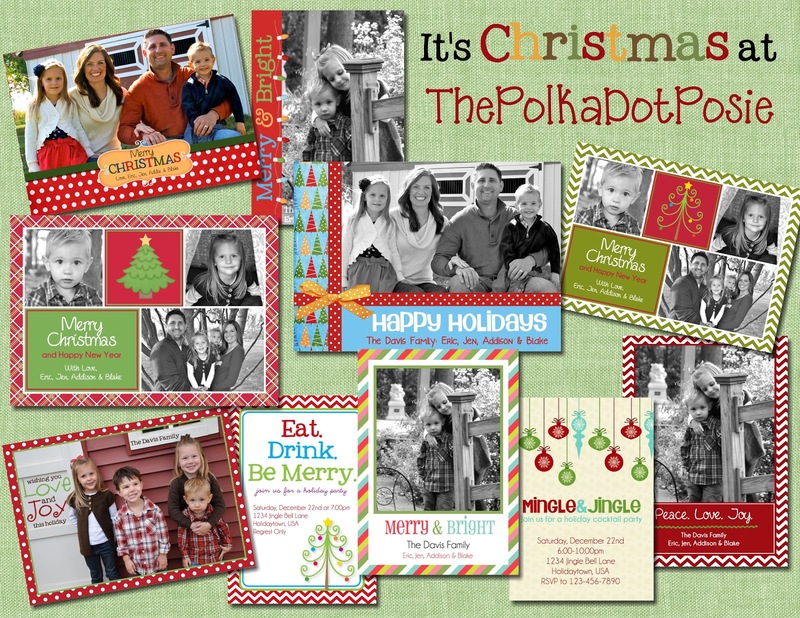 One lucky reader will win their own printable CUSTOM HOLIDAY CARD or INVITATION!!! You tell us what you love and we will design an original card or invitation just for you! Center your card around a beautiful picture, or keep it simple with a classic look. Are you hosting a holiday cocktail or tacky Christmas Sweater party? We can make anything you are looking for!! And that's it!!! No need to Tweet, Blog or Facebook about the giveaway...unless you want to of course. We don't want you to have to work for your gift. Ha! Thanks so much for stopping by today friends!!! Let the holiday season begin!! 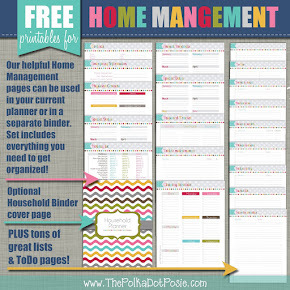 I follow the blog and enjoy seeing all the neat things you make. I follow the ThePolkaDotPosie on Facebook. I love the holidays because we get to spend time with family. I love all of the hustle and bustle too. 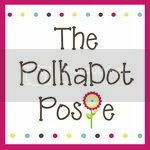 I follow the Polka Dot Posie on Facebook. I love picking out a tree and decorating! And having a fire with all the stockings hung! My favorite part of the holdidays, is showing up Christmas eve at my grandparents to start a day of family traditions, great food, santas lap & more memories being made! Its a beautiful thing, every single year! My fave part of the holidays is the feeling of the holidays. The lights, the cold, the warm feeling!! What I love most about the Holidays right now is creating new traditions with My husband and children. I also love the age they are at right now because my daughter is really starting to understand more the reason for the season! I'm already following on Twitter. I love spending time with my family during the holidays and giving gifts to them as well as to strangers who are in need. Followed the blog :) I don't do twitter so that will be it for me! I love seeing everything decorated in beautiful lights and spending time with family. My favorite part though is stockings on Christmas morning. We did that when I was growing up and when I moved out I missed it so much. Last year my husband and I revived it for ourselves and we are doing it again this year and for many years to come. My favorite part of the Holiday season is being with my family. I love listening to Christmas music and dancing with my boys, decorating the house like Clarke Griswold, trimming the tree, snuggling up on the couch to watch all the Christmas classics, the parties, the pretty packages, and of course the giving and grateful spirit that everyone is in. Oh and the cookies aren't half bad either! My favorite part of the holidays is the happy mood it puts everyone in. I love how cheerful and generous everyone is! I love how people become just a bit nicer to one another. And all of the reasons to get together with family and friends is just wonderful! the rest of the year just seems to be too busy even though you have the best of intentions! My favorite part of the holidays is listening to Christmas music, decorating the house/tree, and spending time with family! My favorite part of the holiday season is finding or making the perfect gifts for my family and friends. It's so fun to watch them open their presents! My favorite part of the holiday season is decorating! I have to tell myself I can't get anything out until at least Thanksgiving! And love ya'll on Facebook!